mmm...comfort food. I had a rough day today, so Ryan made dinner. 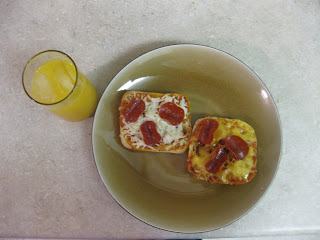 Homemade pizza and orange juice. Weird combination, I know, but whenever we had pizza as a kid my Mom used to serve it with orange juice...ya know, for the vitamins :) I have 2 potlucks at work tomorrow, along with white elephant gift exchanges so I made some gift tags as my white elephant gift. 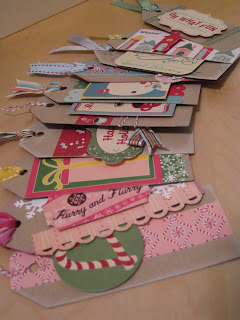 I made them using my new Cricut and Cosmo Cricket's Jolly by Golly line. And, I could really use some, so hopefully no one wants them and I can steal them away:) XOXO, Holly & CO.
Aren't white elephant gifts suppose to be something that you don't want? Those are going to go quickly if the rest of the prizes are gag gifts. Supper cute. P.S. I'm thinking of getting the cricut for Christmas. How much do you like it?